Onchocerciasis, also known as river blindness and Robles disease, is a disease caused by infection with the parasitic worm Onchocerca volvulus. Symptoms include severe itching, bumps under the skin, and blindness. It is the second most common cause of blindness due to infection, after trachoma. The parasite worm is spread by the bites of a black fly of the Simulium type. Usually, many bites are required before infection occurs. These flies live near rivers, hence the name of the disease. Once inside a person, the worms create larvae that make their way out to the skin. Here, they can infect the next black fly that bites the person. There are a number of ways to make the diagnosis including: placing a biopsy of the skin in normal saline and watching for the larva to come out, looking in the eye for larvae, and looking within the bumps under the skin for adult worms. A vaccine against the disease does not exist. Prevention is by avoiding being bitten by flies. This may include the use of insect repellent and proper clothing. Other efforts include those to decrease the fly population by spraying insecticides. Efforts to eradicate the disease by treating entire groups of people twice a year is ongoing in a number of areas of the world. Treatment of those infected is with the medication ivermectin every six to twelve months. This treatment kills the larva but not the adult worms. The antibiotic doxycycline weakens the worms by killing an associated bacterium called Wolbachia, and is recommended by some as well. The lumps under the skin may also be removed by surgery. About 17 to 25 million people are infected with river blindness, with approximately 0.8 million having some amount of loss of vision. Most infections occur in sub-Saharan Africa, although cases have also been reported in Yemen and isolated areas of Central and South America. In 1915, the physician Rodolfo Robles first linked the worm to eye disease. It is listed by the World Health Organization as a neglected tropical disease. The skin is itchy, with severe rashes permanently damaging patches of skin. The Mazzotti reaction, first described in 1948, is a symptom complex seen in patients after undergoing treatment of onchocerciasis with the medication diethylcarbamazine(DEC). Mazzotti reactions can be life-threatening, and are characterized by fever, urticaria, swollen and tender lymph nodes, tachycardia, hypotension, arthralgias, oedema, and abdominal pain that occur within seven days of treatment of microfilariasis. This is an unusual form of epidemic epilepsy associated with onchocerciasis. This syndrome was first described in Tanzania by Louise Jilek-Aall, a Norwegian psychiatric doctor in Tanzanian practice, during the 1960s. It occurs most commonly in Uganda and South Sudan. It manifests itself in previously healthy 5–15-year-old children, is often triggered by eating or low temperatures and is accompanied by cognitive impairment. Seizures occur frequently and may be difficult to control. The electroencephalogram is abnormal but cerebrospinal fluid (CSF) and magnetic resonance imaging (MRI) are normal or show non-specific changes. If there are abnormalities on the MRI they are usually present in the hippocampus. Polymerase chain reaction testing of the CSF does not show the presence of the parasite. In 1992, the Onchocerciasis Elimination Programme for the Americas, which also relies on ivermectin, was launched. On July 29, 2013, the Pan American Health Organization (PAHO) announced that after 16 years of efforts, Colombia had become the first country in the world to eliminate the parasitic disease onchocerciasis. In September 2015, the Onchocerciasis Elimination Program for the Americas announced that onchocerciasis only remained in a remote region on the border of Brazil and Venezuela. The area is home to the Yanomami indigenous people. The first countries to receive verification of elimination were Colombia in 2013, Ecuador in 2014, and Mexico in 2015. Guatemala has submitted a request for verification. The key factor in elimination is mass administration of the antiparasitic drug ivermectin. The initial projection was that the disease would be eliminated from remaining foci in the Americas by 2012. For the treatment of individuals, doxycycline is used to kill the Wolbachia bacteria that live in adult worms. This adjunct therapy has been shown to significantly lower microfilarial loads in the host, and may have activity against the adult worms, due to the symbiotic relationship between Wolbachia and the worm. In four separate trials over 10 years with various dosing regimens of doxycycline for individualized treatment, doxycycline was found to be effective in sterilizing the female worms and reducing their numbers over a period of four to six weeks. Research on other antibiotics, such as rifampicin, has shown it to be effective in animal models at reducing Wolbachia both as an alternative and as an adjunct to doxycycline. However, doxycycline treatment requires daily dosing for at least four to six weeks, making it more difficult to administer in the affected areas. 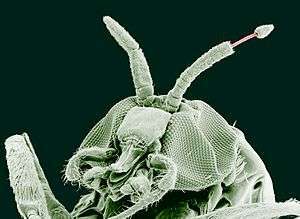 About 37 million people are infected with this parasite; about 300,000 of those had been permanently blinded. As of 2008, about 99% of onchocerciasis cases occurred in Africa. Onchocerciasis is currently endemic in 30 African countries, Yemen, and isolated regions of South America. Over 85 million people live in endemic areas, and half of these reside in Nigeria. Another 120 million people are at risk for contracting the disease. Due to the vector’s breeding habitat, the disease is more severe along the major rivers in the northern and central areas of the continent, and severity declines in villages farther from rivers. Onchocerciasis was eliminated in the northern focus in Chiapas, Mexico, and the focus in Oaxaca, Mexico, where Onchocerca volvulus existed, was determined, after several years of treatment with ivermectin, as free of the transmission of the parasite. Onchocerca originated in Africa and was probably exported to the Americas by the slave trade, as part of the Columbian exchange that introduced other old world diseases such as yellow fever into the New World. Findings of a phylogenetic study in the mid-90s are consistent with an introduction to the New World in this manner. DNA sequences of savannah and rainforest strains in Africa differ, while American strains are identical to savannah strains in western Africa. The microfilarial parasite that causes the disease was first identified in 1874 by an Irish naval surgeon, John O’Neill, who was seeking to identify the cause of a common skin disease along the west coast of Africa, known as “craw-craw”. Rudolf Leuckart, a German zoologist, later examined specimens of the same filarial worm sent from Africa by a German missionary doctor in 1890 and named the organism Filaria volvulus. Since 1988, ivermectin has been provided free of charge for use in humans by Merck through the Mectizan donation program (MDP). The MDP works together with ministries of health and nongovernmental development organisations, such as the World Health Organization, to provide free ivermectin to those who need it in endemic areas. Uganda's government, working with the Carter Center river blindness program since 1996, switched strategies for distribution of Mectizan. The male-dominated volunteer distribution system had "failed to take advantage of traditional kinship structures and roles." The program switched in 2014 from village health teams to community distributors, primarily selecting women with the goal of assuring that everyone in the circle of their family and friends received river blindness information and Mectizan. A Cochrane review compared outcomes of people treated with ivermectin alone versus doxycycline plus ivermectin. While there were no differences in most vision-related outcomes between the two treatments, there was low quality evidence suggesting treated with doxycycline plus ivermectine showed improvement in iridocyclitis and punctate keratitis, over those treated with ivermectine alone. 1 2 3 4 5 6 7 8 9 10 "Onchocerciasis Fact sheet N°374". World Health Organization. March 2014. Retrieved 20 March 2014. 1 2 "Onchocerciasis (also known as River Blindness)". Parasites. CDC. May 21, 2013. Retrieved 20 March 2014. 1 2 "Parasites – Onchocerciasis (also known as River Blindness) Epidemiology & Risk Factors". CDC. May 21, 2013. Retrieved 20 March 2014. 1 2 "Onchocerciasis (also known as River Blindness) Prevention & Control". Parasites. CDC. May 21, 2013. Retrieved 20 March 2014. 1 2 Murray, Patrick (2013). Medical microbiology (7th ed.). Philadelphia: Elsevier Saunders. p. 792. ISBN 9780323086929. 1 2 3 Brunette, Gary W. (2011). CDC Health Information for International Travel 2012 : The Yellow Book. Oxford University Press. p. 258. ISBN 9780199830367. ↑ Reddy M, Gill SS, Kalkar SR, Wu W, Anderson PJ, Rochon PA (October 2007). "Oral drug therapy for multiple neglected tropical diseases: a systematic review". JAMA. 298 (16): 1911–24. doi:10.1001/jama.298.16.1911. PMID 17954542. ↑ Baldo L, Desjardins CA, Russell JA, Stahlhut JK, Werren JH (2010-02-17). "Accelerated microevolution in an outer membrane protein (OMP) of the intracellular bacteria Wolbachia". BMC Evol Biol. 10: 10:48. doi:10.1186/1471-2148-10-48. PMC 2843615 . PMID 20163713. 1 2 Francesca Tamarozzi; Alice Halliday; Katrin Gentil; Achim Hoerauf; Eric Pearlman; Mark J. Taylor (2011-07-24). "Onchocerciasis: the Role of Wolbachia Bacterial Endosymbionts in Parasite Biology, Disease Pathogenesis, and Treatment". Clinical Microbiology Reviews. 24: 459:468. doi:10.1128/CMR.00057-10. PMC 3131055 . PMID 21734243. 1 2 Wani, MG (February 2008). "Onchocerciasis". Southern Sudan Medical Journal. ↑ Ali MM, Baraka OZ, AbdelRahman SI, Sulaiman SM, Williams JF, Homeida MM, Mackenzie CD (15 February 2003). "Immune responses directed against microfilariae correlate with severity of clinical onchodermatitis and treatment history". Journal of Infectious Diseases. 187 (4): 714–7. doi:10.1086/367709. JSTOR 30085595. PMID 12599094. ↑ Murdoch ME, Hay RJ, Mackenzie CD, Williams JF, Ghalib HW, Cousens S, Abiose A, Jones BR (September 1993). "A clinical classification and grading system of the cutaneous changes in onchocerciasis". Br J Dermatol. 129 (3): 260–9. doi:10.1111/j.1365-2133.1993.tb11844.x. PMID 8286222. ↑ Dowell SF, Sejvar JJ, Riek L, Vandemaele KA, Lamunu M, Kuesel AC, Schmutzhard E, Matuja W, Bunga S, Foltz J, Nutman TB, Winkler AS, Mbonye AK (2013). "Nodding syndrome". Emerg Infect Dis. 19 (9): 1374–3. doi:10.3201/eid1909.130401. 1 2 3 4 5 6 7 8 James, William D.; Berger, Timothy G.; Elston, Dirk M; Odom, Richard B. (2006). Andrews' Diseases of the Skin: clinical dermatology (10th ed.). Saunders Elsevier. ISBN 0-7216-2921-0. OCLC 62736861. ↑ Marty AM. "Filariasis". eMedicine. Retrieved 2009-10-22. ↑ "Onchocerciasis Control Programme (OCP)". Programmes and Projects. World Health Organization. Retrieved 2010-06-15. ↑ "African Programme for Onchocerciasis Control (APOC)". Programmes and Projects. World Health Organization. Retrieved 2010-06-15. ↑ "Onchocerciasis Elimination Program for the Americas (OEPA)". Programmes and Projects. World Health Organization. Retrieved 2010-06-15. ↑ "NEWS SCAN: Columbia ousts river blindness; Vaccine-derived polio in India; Danish Salmonella trends". CIDRAP News. July 30, 2013. ↑ "Brazil and Venezuela border is the last place in the Americas with river blindness". Outbreak News Today. Retrieved 3 October 2015. ↑ "Onchocerciasis Elimination Program for the Americas (OEPA)". World Health Organization. Retrieved 3 October 2015. ↑ "Onchocerciasis". World Health Organization. Retrieved 3 October 2015. ↑ Sauerbrey, M (September 2008). "The Onchocerciasis Elimination Program for the Americas (OEPA).". Annals of tropical medicine and parasitology. 102 Suppl 1: 25–9. doi:10.1179/136485908x337454. PMID 18718151. 1 2 3 4 5 Rea PA, Zhang V, Baras YS (2010). "Ivermectin and River Blindness". American Scientist. 98 (4): 294–303. ↑ Trattler, Bill; Gladwin, Mark (2007). Clinical Microbiology Made Ridiculously Simple. Miami: MedMaster. ISBN 0-940780-81-X. OCLC 156907378. ↑ Taylor MJ, Bandi C, Hoerauf A (2005). "Wolbachia bacterial endosymbionts of filarial nematodes". Advances in Parasitology. 60: 245–84. doi:10.1016/S0065-308X(05)60004-8. PMID 16230105. 1 2 Hoerauf A (2008). "Filariasis: new drugs and new opportunities for lymphatic filariasis and onchocerciasis". Current Opinion in Infectious Diseases. 21 (6): 673–81. doi:10.1097/QCO.0b013e328315cde7. PMID 18978537. ↑ Yates DM, Wolstenholme AJ (August 2004). "An ivermectin-sensitive glutamate-gated chloride channel subunit from Dirofilaria immitis". International Journal for Parasitology. 34 (9): 1075–81. doi:10.1016/j.ijpara.2004.04.010. PMID 15313134. ↑ Harder A (2002). "Chemotherapeutic approaches to nematodes: current knowledge and outlook". Parasitology Research. 88 (3): 272–7. doi:10.1007/s00436-001-0535-x. PMID 11954915. ↑ Wolstenholme AJ, Rogers AT (2005). "Glutamate-gated chloride channels and the mode of action of the avermectin/milbemycin anthelmintics". Parasitology. 131 (Suppl:S85–95): S85–95. doi:10.1017/S0031182005008218. PMID 16569295. ↑ Ejere HO, Schwartz E, Wormald R, Evans JR (2012). "Ivermectin for onchocercal eye disease (river blindness)". Cochrane Database Syst Rev. 8: CD002219. doi:10.1002/14651858.CD002219.pub2. PMC 4425412 . PMID 22895928. ↑ "What is river blindness?". Sightsavers International. Archived from the original on 2007-12-15. Retrieved 2008-01-28. ↑ "Status of onchocerciasis in APOC countries". World Health Organization. 2008. Retrieved 2010-04-26. 1 2 "Epidemiology". Stanford University. 2006. ↑ Peña Flores G.; Richards F.; et al. (2010). "Lack of Onchocerca volvulus transmission in the northern focus in Chiapas". Am. J. Trop. Med. Hyg. 83 (1): 15–20. doi:10.4269/ajtmh.2010.09-0626. ↑ Peña Flores G.; Richards F.; Domínguez A. (2010). "Interruption of transmission of Onchocerca volvulus in the Oaxaca focus". Am. J. Trop. Med. Hyg. 83 (1): 21–27. doi:10.4269/ajtmh.2010.09-0544. ↑ Zimmerman, PA; Katholi, CR; Wooten, MC; Lang-Unnasch, N; Unnasch, TR (May 1994). "Recent evolutionary history of American Onchocerca volvulus, based on analysis of a tandemly repeated DNA sequence family.". Molecular Biology and Evolution. 11 (3): 384–92. PMID 7516998. ↑ O’Neill, John (1875). "O'Neill J. On the presence of a filaria in " craw-craw" (PDF). The Lancet. 105: 265–266. doi:10.1016/s0140-6736(02)30941-3. ↑ "A Short History of Onchocerciasis". Retrieved 18 October 2015. ↑ Robles, Roberto (1917). "Enfermedad nueva en Guatemala". La Juventud Médica. ↑ Blacklock, DB (22 January 1927). "THE INSECT TRANSMISSION OF ONCHOCERCA VOLVULUS (LEUCKART, 1893): THE CAUSE OF WORM NODULES IN MAN IN AFRICA.". British Medical Journal. 1 (3446): 129–33. doi:10.1136/bmj.1.3446.129. PMID 20772951. ↑ Kluxen, G; Hoerauf, A (2008). 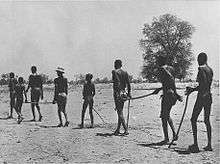 "The significance of some observations on African ocular onchocerciasis described by Jean Hissette (1888-1965)". Bull Soc Belge Ophtalmol. 307: 53–8. ↑ Hisette, Jean (1932). Mémoire sur l’Onchocerca volvulus "Leuckart" et ses manifestations oculaires au Congo belge. pp. 433–529. ↑ Ridley, Harold (1945). "OCULAR ONCHOCERCIASIS Including an Investigation in the Gold Coast". Br J Ophthalmol. 29 (Suppl): 3–58. doi:10.1136/bjo.29.suppl.3. ↑ Kluxen, G. "Harvard African Expedition [Internet]". Retrieved 18 October 2015. ↑ Thylefors B, Alleman MM, Twum-Danso NA (May 2008). "Operational lessons from 20 years of the Mectizan Donation Program for the control of onchocerciasis". Trop Med Int Health. 13 (5): 689–96. doi:10.1111/j.1365-3156.2008.02049.x. PMID 18419585. ↑ "Kinship Powerful in River Blindness Fight." Carter Center Update, The Carter Center, Atlanta, Georgia. Summer, 2016. pp. 4-5. ↑ Allen JE, Adjei O, Bain O, Hoerauf A, Hoffmann WH, Makepeace BL, Schulz-Key H, Tanya VN, Trees AJ, Wanji S, Taylor DW (April 2008). Lustigman S, ed. "Of Mice, Cattle, and Humans: The Immunology and Treatment of River Blindness". PLoS Negl Trop Dis. 2 (4): e217. doi:10.1371/journal.pntd.0000217. PMC 2323618 . PMID 18446236. ↑ "River blindness resistance fears". BBC News. 2007-06-14. Retrieved 2007-06-15. ↑ Osei-Atweneboana MY, Eng JK, Boakye DA, Gyapong JO, Prichard RK (June 2007). "Prevalence and intensity of Onchocerca volvulus infection and efficacy of ivermectin in endemic communities in Ghana: a two-phase epidemiological study". Lancet. 369 (9578): 2021–9. doi:10.1016/S0140-6736(07)60942-8. PMID 17574093. ↑ Abegunde AT, Ahuja RM, Okafor NJ (2016). "Doxycycline plus ivermectin versus ivermectin alone for treatment of patients with onchocerciasis". Cochrane Database Syst Rev. 1: CD011146. doi:10.1002/14651858.CD011146.pub2. PMID 26771164.